So, I don't how I managed to forget about posting this. I hang my head in shame. 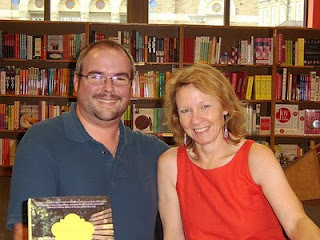 A couple of weeks back I had the great opportunity to meet Meg Waite Clayton, author of the excellent The Wednesday Sisters. She was doing a reading and signing at the Borders in Ann Arbor (only about an hour from me), so I couldn't pass up the opportunity. I had a delightful time. Meg read a selection from The Wednesday Sisters and then took time to answer questions and to sign our books, even those of us who brought their LTER copies... We spent some time afterwards talking, and I feel like I've found a long lost friend! Thanks for a great night, Meg! To learn more about Meg and The Wednesday Sisters, you can visit her website here. If you haven't yet read The Wednesday Sisters, I'd highly recommend it. You can read my review by clicking above, but I'll say again what a great book it is. That guy looks awfully handsome, but I don't know about that lady in red. Thanks for joining me, David! So nice to meet you in person! And I know for a fact that the lady in red is fabulous!